The workshop at Velocity is as much for the kids as it is for adults. 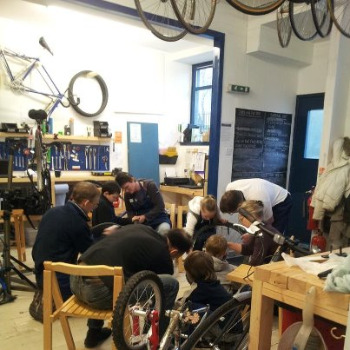 We believe adults and children can learn loads from one another (especially when it comes to fixing and riding bikes) so what better way to learn than together?! We've created a Young Persons Policy to ensure young people are treated fairly and equally, including their ability to become a member of Velocity (see links below). If you'd like to use this service, pop along to the workshop (1 Crown Avenue), give us a call (01463 419956) or drop the Go ByCycle team an email (penny@velocitylove.co.uk) to book your place in the workshop and have the team help you fix your own!